‘Twas a mere 12 months ago that, with the closing of landmark shop Dragon Lady Comics, that we — with some duct tape and a quickly conceived plan — went about keeping a comics presence alive in Toronto’s Little Italy. The Comic Book Lounge + Gallery has changed a bit since the day we moved the first fixtures in (inherited from Dragon Lady). Here’s a before and after shot of the space from the same perspective looking in from the top of the stairs —- the top photo was taken on February 6, 2012…. the lower was taken on February 6, 2013. 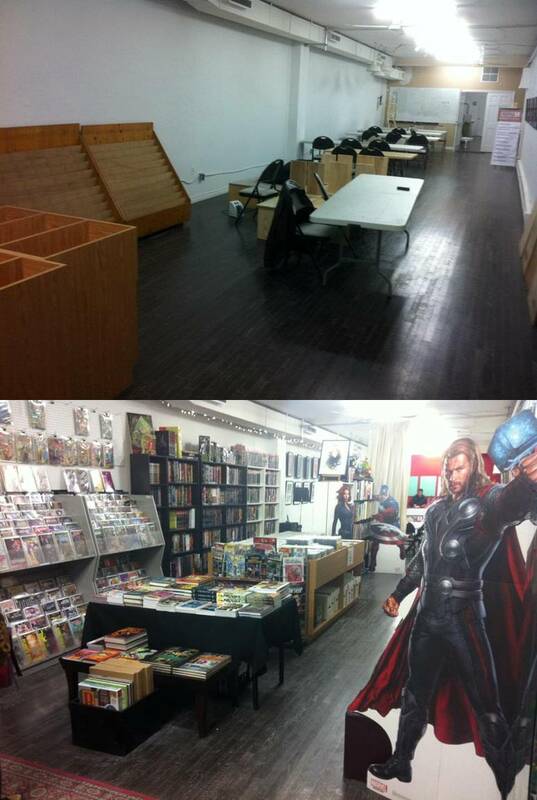 The Comic Book Lounge and Gallery officially opened it’s doors on Wednesday, February 8, 2012. Come in and celebrate our first anniversary this Saturday (Feb. 9)!